Cat flu is an umbrella term for infections of the upper respiratory tract (nose, throat and trachea) and the cat's other mucous membranes. Cat flu is highly contagious and therefore spreads easily in areas where large numbers of cats live together, such as in cat shelters, kennels and catteries. The viruses that cause cat flu can also affect other mucous membranes, such as the bowel. As a result, infection with cat flu can also lead to diarrhoea. Cat flu is caused by two viruses: the rhinotracheitis virus (FHV-1, a herpes virus that can come back to life in stressful situations) and the calici virus. Chlamydia and Bordetella bacteria can also cause cat flu. They can do this individually, but also in combination with one of the viruses mentioned above. Herpes not only affects a cat's airways, the eyes can also be affected by the herpes virus. In these cases we refer to it as conjunctivitis. This causes the "pink part" of the eye to get irritated, which can result in a highly unpleasant eye infection for the cat. To prevent irreparable damage to the eyes, it is important that you act as quickly as possible, as soon as the first symptoms of cat flu present themselves. The symptoms of cat flu can be present in various ways. They will be more prominent in some cats than in others. If moderate symptoms continue for longer than a few days, we recommend that you consult with your veterinarian, who can determine whether your cat actually has cat flu. Should your cat suffer from diarrhoea or other serious symptoms, you must make an appointment with your veterinarian as soon as possible. You can take various measures to reduce your cat's risk of contracting cat flu. Healthy cats can be immunised against cat flu by your veterinarian. This significantly reduces the risk of infection. You can have young cats immunised from the age of nine weeks. For an optimal protection, it is recommended that you repeat this immunisation within one month. To protect your cat permanently, you must have it immunised annually. Once a cat is infected, you can only treat the symptoms of the disease. That is why it is important to try and prevent infection. You can do this by giving your cat F-lysine (officially called L-lysine) (preventively) when your cat's immune system is compromised. F-lysine is an essential amino acid that helps suppress the feline herpes virus. It is also important to make sure that your cat's immune system is as strong as possible. A good resistance reduces the risk of infection and suppresses the development of the virus. You can do this by giving your cat a high-quality diet, supplemented with vitamins and minerals if required, such as Nutri-plus gel or Groene Os Multivitamin and Mineral Complex. 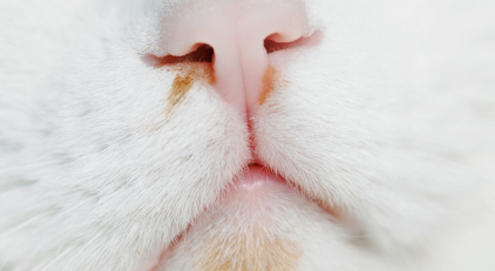 Do you have any questions about cat flu or respiratory conditions in cats in general? Please contact our veterinarian by phone on 020 3191 8322, or via e-mail at: veterinarian@vetsend.co.uk. Helps boost immune system and increase resistance. For cats with a viral infection .